Gift a little one the ability to swim! Kingswim Gift Cards have now arrived and can be purchased in Centres. Ask our team next time you come in for your lesson. 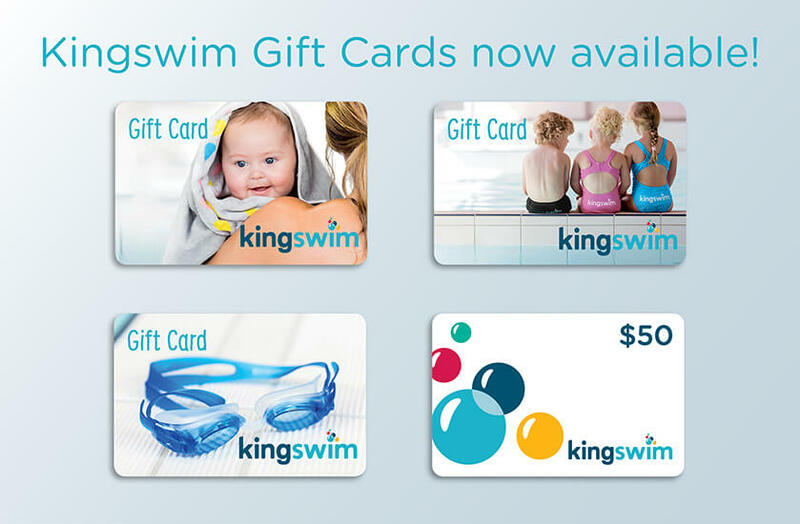 Kingswim Gift Cards can only be redeemed for services or products including swim lessons, Fast Track, holiday programs or merchandise at any Kingswim Centre. Please speak to one of our staff at a Kingswim Centre for further details pertaining to these services or products. Gift Cards entitle the holder to goods/services equal to the value stated on the card, or remaining after partial redemption, usable for as many transactions as available funds allow. Gift Cards only redeemable within the Kingswim Centre that activated the card. Cards may be transferred to an alternate Kingswim Centre by phoning our Customer Care Team on 1300 054 647. Gift Cards may not be exchanged or redeemed (wholly or partly) for cash and cannot be topped up or reloaded at any Kingswim Centre. Any unused balance will remain on the Kingswim Gift Card. Kingswim Gift Cards expire 3 years from the date of issue. Our record of expiry date is final. Should Kingswim suspect any fraud relating to a Gift Card, Kingswim may refuse to redeem the Card until Kingswim is satisfied that no fraud has occurred. Kingswim is not liable for any lost/stolen Kingswim Gift Cards and will be indemnified by the person or party that was issued the Kingswim Gift Card for any claim, costs or expenses arising as a result of a lost/stolen Kingswim Gift Card or any fraudulent behaviour in respect of the Kingswim Gift Card. Kingswim Gift Cards cannot be used to purchase other Kingswim Gift Cards or for any other purposes outside of the available services or products identified in these Terms and Conditions.